It is time to become aware of the place microformats have in your site structure. Microformats are attributes present in the markup of your pages that grant an explicit deceleration (eg "this is a Blog Post") as to the role of the content present in the document. As their use increases, those sites without the additional information accuracy gained though microformatting may find themselves falling behind in search results and clickthroughs. A small time investment adding microformatting to your website content may yield large returns to your site and its content strategy. HTML5 already has elements that lend some indication as to their role in your document. These range from weak (ul indicates a list of something) to the strong (address representing the contact information for the document or section). In HTML5 we have document formatting present in the markup, but it is essentially macro formatting. These are rough tools used to describe information as they relate structurally as a web document, all documents on the web must be structured to fit into this document model. They describe the role of the content in the document structure but provide little insight into the meaning of the document's content. Microformats exist to be compatible with this web page markup, but make available enhancements to add better semantics to the presented data. This is presently clear enough for anyone reading to divine the elements of the contact information from the text in the address element. This illustrates one of the grand dichotomies between machines and men. We can intuitively understand the context of a grouping of text while a machine cannot. Microformats, therefore, are in the service of machines, to allow an explicit programmatic understanding of the context of items in the markup. This is performed by threading into the existing markup another more semantically narrow and accurate markup: a schema. These schemas are already in use by Google for displaying extra information in search results, you can see this concept in Google documentation as "rich snippets". The data for these snippets are informed by schema use in the repective indexed pages. When search results display properly microformatted products, which are listed for sale on a page, the extra product information shown in the search results comes from information communicated through the use of the Product schema. As schema use grows you may expect to see more schemas used as well as a greater adoption of schemas understanding in other services. Applying a microformat is a matter of adding more attributes to existing tags (and more tags where necessary). The Schema.org documentation goes into detail on the proper application of these attributes. Let us microformat that address element to make it semantically clearer. One drawback to microformatting is the proliferation of markup tags required to apply the formatting to detailed data. In order to properly apply microformatting to content you find yourself requiring a tag where there was none use a "span" tag or a "div" tag (if it contains spans). These are the most generic of HTML tags: the most basic and context neutral. 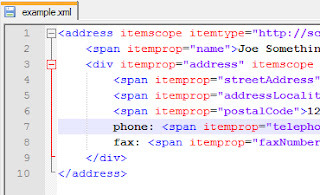 Schema markup may be applied to any document element, try to keep things simple. That is a little more appropriate for our use. Now the contact information is more specific but also retains the address microformat as well. You may also use the Organization schema if the contact information is for a business entity. Schemas can go a long way in supplying more information from your web presence. The compelling use case today is to supply Google better information for search results on your web page. It is also easy to see how more applications may be developed to take better advantage of microformats as they gain wider adoption. On May 17, 2016 Google announced yet another expansion of Schema usage and incorporation of Schema in affecting the display of search results. In Google's words, "For site owners, this is a new opportunity to stand out in Search results and attract more targeted users to your page. For example, if you have a recipe site, you can build a richer preview of your content with a prominent image for each dish. 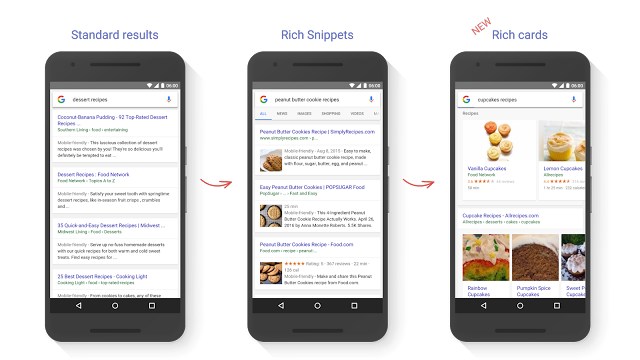 This visual format helps users find what they want right away, so you're getting users who specifically want that especially delicious cookie recipe you have." So what're you waiting for? Get your site's content using schema ASAP. This microformats will COMPLETELY move our business to the next level.